I got this recipe from this blog: Rumbly Tumbly Treats and I can't wait to try it! How easy is this? Not to mention super YUM! Spray crock pot with some non-stick spray and then put all ingredients in the crock pot. Cook on low for 7-8 hours. 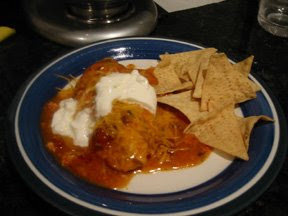 Top with sour cream and cheddar cheese. We'll be puttin some guac on our's too. See my Chipotle guac recipe "HERE." Eat with flour tortilla or tortilla chips. You could also put it on top of some spanish rice. 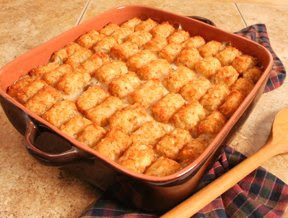 A good old Minnesota tradition...Tater Tot Hotdish! Everyone's got their own version of this, but here's mine. :) So yummy. The epitome of "comfort food." 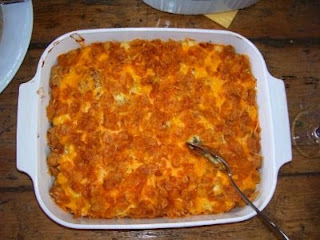 In a large skillet cook ground beef with onion, salt and pepper; drain and spread into the bottom of a 9x13 inch baking dish. Add vegetables & then tater tots; mix cream of mushroom and cream of celery soup together and pour mixture over dish. Top with cheese. In a large stockpot or dutch oven, melt butter over medium heat. Add onions and cook for about 3 minutes before adding the celery and carrots. Continue cooking a few more minutes before adding the garlic. Stir until fragrant. 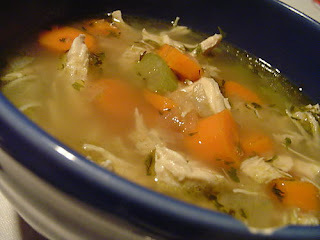 Add the chicken, broth, bay leaf, marjoram, thyme, parsley and ground pepper to taste. Bring to a boil and then reduce. Simmer lightly for 30 minutes. Add the noodles* and simmer until cooked, about 8 minutes. *Note: The noodles will continue to absorb the liquid as leftover sit in the pot/fridge. If you want to prevent your soup from thickening and becoming too chunky, you can reduce the amount of broth slightly and cook the noodles in a separate pot, combining with the soup in your bowl as you are about to eat.